Welcome to Create Your Own Interactive Website! Click below to order a paperback copy of our book, Create Your Own Interactive Website! Click below to order an Ebook reader copy of our book, Create Your Own Interactive Website! Click below to order a PDF copy of our book, Create Your Own Interactive Website! This page also has additional ordering options. Welcome to our website, book and course on how to build your own interactive website using Joomla, the world's most powerful web building tool! There is an online revolution occurring in the world today. Businesses are increasingly selling their products and services online. Educational organizations are teaching their courses online. Social and political organizations are building their communities online. Authors are promoting their books online. Families are shopping and researching products online. The sharing of knowledge and ideas is increasingly occurring online. 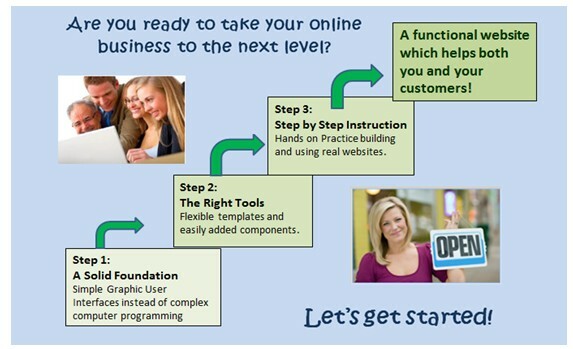 If you want your business or social organization to succeed, it is time to join this online revolution. With our course, you will be able to build your own modern interactive website to bring in new customers, organize your community members and expand your online programs to accommodate future growth. This course is intended for individuals who want to control and improve their own interactive website. It is also useful for anyone wishing to help others build interactive websites. Wait a Minute… Aren't All Websites Interactive? An interactive website is a site that allows you to easily interact with your site viewers through discussion forums, community events, feedback forms and other interactive content. These interactive tools require the use of a database managed by a Content Management System such as Joomla, Wordpress or Drupal. Just 10 years ago, nearly all websites were NOT interactive. Instead, they were static pages that only displayed content with almost no interaction. These outdated websites were either hand-coded or made using a coding tool such as Dreamweaver. Even today, over half of all websites still use these limited and outdated methods to display their content. Our course reviews and uses the latest and most powerful free tools for setting up and managing a truly interactive website to help you build stronger relationships with your online community. Ideally, your website should be thoughtfully structured like a well organized book. It should be a means of sharing information in an efficient and interesting manner like a well designed course. The problem is that this idea of sharing knowledge in an organized manner has gotten lost in the marketing hype of folks setting up their own website as quickly as possible. People fall victim to the lure of a pretty looking website without realizing that underneath the pretty face, their website will soon become a hopeless mess. They fail to understand the need for a solid foundation and wind up building their website on a bed of quicksand. Most websites become a dead end as people get locked into inadequate web tools that are not capable of efficiently organizing and presenting pages, images, videos, events, forums, classes, feedback forms and other interactive content. Ask yourself... what is your goal? What do you want to communicate? What do you want to accomplish with your website? If you just want a personal online page with a series of rambling posts, then just about any web building tool will do. But if you want to build an online business or grow an online community, then you need to take a closer look at the foundation of your website. If you want a truly interactive website, we will show you how to build it – not the fastest way – but in a way that will actually help you achieve your goals, communicate your ideas and grow your online community. What makes this course different from a traditional web building course? In this introduction, we will explain ten ways our course is different from a traditional web building course. 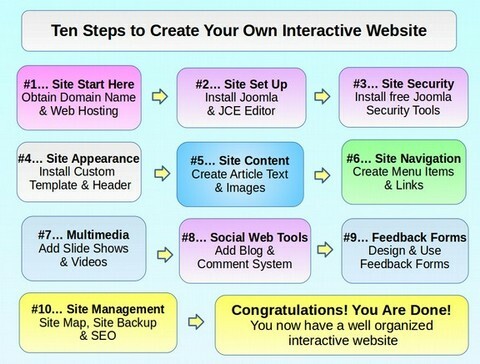 We will then outline ten essential steps for building a modern interactive website. Thanks to free Joomla web building tools, it is possible for you to have complete control over the content, appearance and function of your website – and build an interactive responsive website without learning any computer programming! Just as a web browser helps you see a website by clicking on buttons, Joomla helps you make a website by clicking on buttons! 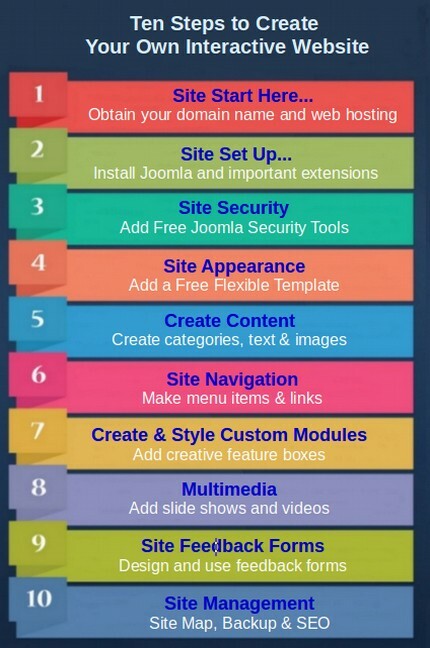 Our primary goal is to introduce you to free Joomla web building tools and give you the knowledge and skills you need to create your own interactive website. However, we also hope to change the way Joomla is taught, and ultimately change the way websites are built. What makes our course different is that it was designed and developed by professional educators who combined have more than 40 years of experience in helping students learn new skills. Our course offers you a new and different way to learn Joomla and build your website. To achieve these goals, our course offers several innovative features. #1: We teach Joomla, the world’s most powerful website building tool! Joomla is a free Content Management System that offers a series of simple graphic user interfaces which allow you to click on buttons to build your own website without any knowledge of computer programming. There are several web building tools on the market today. Each web hosting company offers their own tools to build a simple website. Some of these tools cost money and others are free. But none of them are really appropriate for building a complex interactive website. You can also spend hundreds of dollars to buy a commercial web building tool such as Dreamweaver. But even expensive tools are not very good at creating and organizing a modern interactive website. Dreamweaver involves learning a lot of complex programming and results in old fashioned static web pages. Some folks are lured into creating a free Wordpress website. But the structure of Wordpress is very limiting as it lacks many crucial components needed for organizing a successful small business website. Joomla is as easy as Wordpress, but offers many more features. Joomla offers thousands of free tools to help you create a dynamic interactive website. These include features such as an ongoing events calendar, multimedia presentations, a community forum and a virtual shopping cart with automated inventory control. 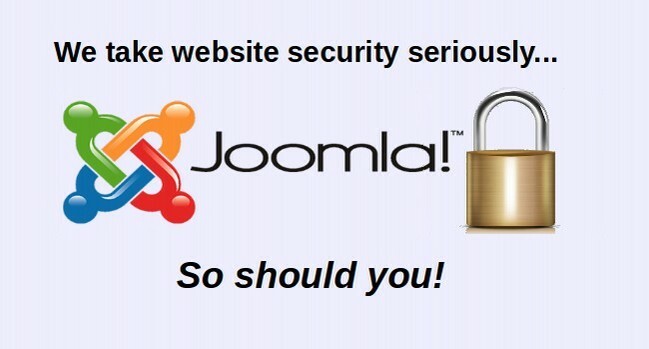 Over 70 million websites now use Joomla. In addition to teaching you how to build an interactive website, we teach you how to build a secure website. We have also seen a dramatic rise in hacker attacks – to the point that any new website you build will be attacked in a matter of days after it is created. The more successful you are in generating traffic, the more attacks you will experience. Sadly, tens of thousands of these hackers were trained by our own US military in hacking techniques. After leaving the military, many of these hackers find a lucrative business in hacking websites and demanding a ransom of thousands of dollars from the website owner in order to restore the website. People may work years to build their business or social website – not knowing that their website home can be destroyed in a matter of minutes by leaving an “open back door” for the hacker to take over their site. We therefore spend more time than any previous web building course describing how to prevent these open back doors. We cover not only several free tools to add to your website to make it more secure, but also how to secure the computer you use to build your website and how to obtain a secure server to host your website. Our approach may seem extreme to some. But hackers are already attacking millions of websites every day. As these attacks increase, we are certain that every possible step should be taken to protect your site against these relentless hackers. The first thing you will notice as you go through our course is the huge number of images. Our book has over 400 images – ten times the number in a traditional book on building websites. This book is about 400 pages. Only 200 pages are actual text. The other 200 pages are images. Many of these images are useful in helping you see what the screens should look like when you are building your own website. Other images are intended to promote multimodal learning. While some students learn best by reading words, others learn best by looking at images. Images have been vastly under-rated both in books and on websites. The human brain has learned from written words for less than two thousand years. But learning from images goes back millions of years and is deeply embedded in the human brain. There are web building books with page after page of text and almost no images. Such text intensive books make learning web building harder than it needs to be. Books and websites should devote much more space to images than they currently do. In this book and on our website, we are trying to set a good example. Later in this course, we will show you how to add and organize images for your own website. Another difference between this book and a traditional Joomla web building book is that we spend over half of the book demonstrating how to add and use extra tools called extensions to your website. We cover not just the Joomla core web tools – but also how to select, install and use essential Joomla extensions. Joomla by itself will not produce an interactive business website. The main power of Joomla comes from the thousands of free add-ons which are available on the Joomla extension directory. We provide detailed instructions on how to install and use 15 important Joomla extensions. When you are done with our course, you will have a complete fully functioning interactive website. Most traditional Joomla books cover only the Joomla core. Almost no time is spent on selecting and using the thousands of free Joomla extensions. This is like having a book on building a house and only covering how to build the foundation. 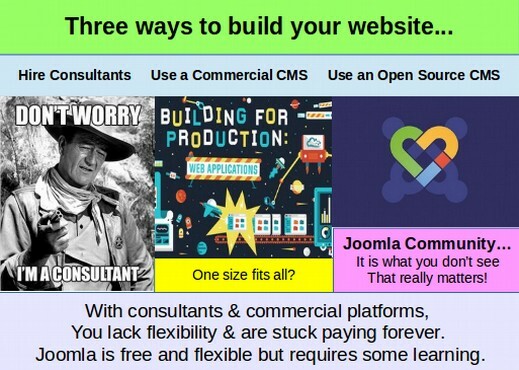 The Joomla core is an excellent foundation. But like building houses, there is much more to building a modern interactive website than the core. Joomla is simply the foundation onto which we need to add slideshows, videos, forms, forums, blogs, and many other essential components. We explain how to add everything you need for a complete interactive website. In our course, we break down complex tasks into a series of simpler tasks. Too often, traditional web courses are presented in an almost random fashion which only confuses readers. We present topics in the order that they are needed to build a secure interactive website. We not only provide the steps for what you need to do, we also provide the reasons why you should build your site in a specific manner. For example, we explain why Joomla is better than Wordpress for a small business website. Later, we explain in detail why some templates are better than others. We provide specific examples of what to look for in web building tools and just as important what tools you should avoid and why you should avoid them. Our extensive research can save you and your online business or social organization years of headaches. Another problem with traditional Joomla courses is that there are huge gaps in the instruction with many important topics not covered at all. For example, all of your web pages should have lots of images. How to handle these images is barely touched on in most courses. There are plenty of courses that claim to help you set up your business website in a matter of minutes. But a clear and complete set of instructions is always easier and better in the long run than shorter but incomplete instructions. 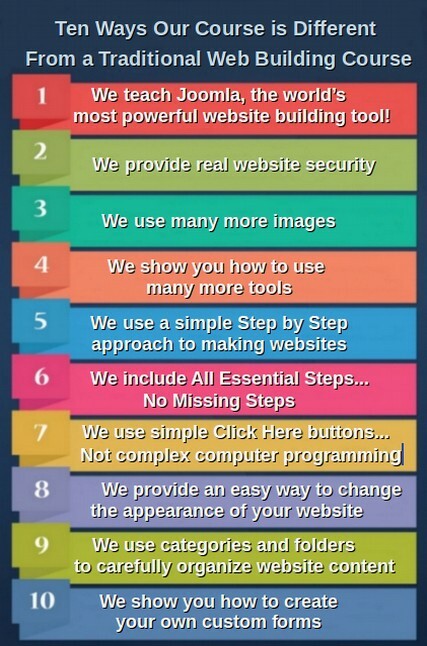 #7: We use simple Click Here buttons, not complex computer programming. We won’t overwhelm you with the complexity of computer programming. We will do our best whenever possible to stay away from technical computer jargon. Instead of computer slang, we use plain English. A common problem with many website building books is that they are written by computer programmers who usually have no background in Education or Learning Theory. It is often difficult for programmers to explain concepts and tasks in non-technical terms. Their instructions are often over the head of the general public. It is difficult to be both a good teacher and a good computer programmer as these are completely different skill sets. In our course, we deliberately stay away from computer programming and its convoluted jargon. 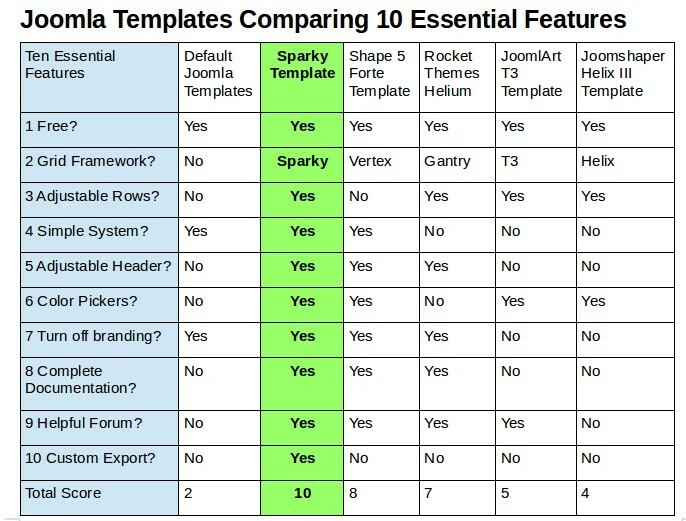 The whole point of Joomla is for people to be able to build a website without doing computer programming. You do not need to become a computer programmer to achieve your goal of creating a successful interactive website. Instead of complex computer programming, we build our website by clicking on buttons. Our focus is on meeting the needs of people who have no background in computer programming. We understand the importance of organizing information into small chunks to ensure that you can become a confident website builder. We also show you how to examine the “module positions” of the template to insure that it offers you an easy way to add feature boxes to your website. Finally, we will look make sure that the template offers an easy way to change the header and layout of your website with just a few clicks of a button. It is important to be able to put any content you want in any position and change the appearance and colors used in your website with just the click of a button. There are many Joomla templates that have rave reviews – but in fact very few offer us the ability to create as many rows of content (called module positions) as we want and need. Many lack documentation. Many will even crash your website! Some have “forums” with literally thousands of unanswered questions from desperate web builders trying to make their poorly designed templates work. We have researched more than one hundred free Joomla templates. One of the biggest benefits of our course is that we will show you what to look for and what to avoid in getting your own interactive website template. We recommend the Sparky Template Framework because it allows you to create as many rows as you want and put as many module positions in each row as you need. You can then easily change the background color of any row with just the click of a button. We show you how to add much more color to your website! We have expanded the power of the Sparky Template Framework with our unique Rainbow Template System! We provide a modified Sparky template with 20 Preset rows - each of which can be set to any of more than 1,000 different background colors with just the click of a button. Our revolutionary Rainbow Template System also provides 20 primary color presets (see graphic above), 20 gradient color presets, 20 border style presets, 20 button style presets and 20 full feature box style presets. All of these preset styles allow you to easily and quickly change the background of any menu item, feature box, row or page of your Joomla website. Add More Color to Your Website Menus! Add More Color to Your Website Feature Boxes! 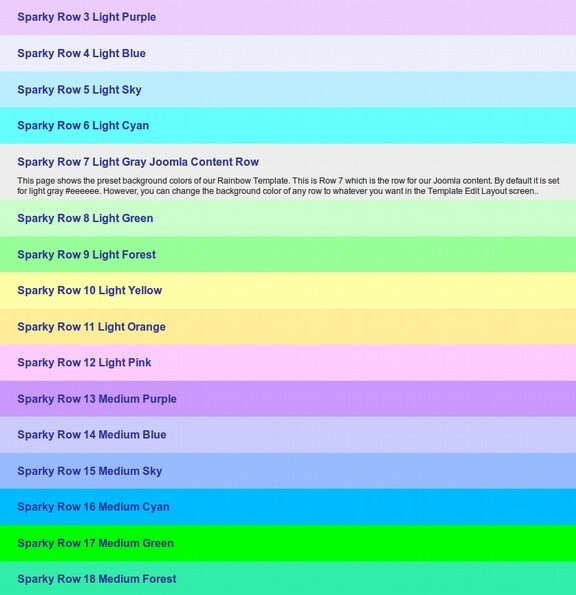 Add More Color to your Website Rows! But you aren’t limited to just the Preset Styles. We show you how to change these preset styles to make your own designs. Making a colorful website has never been so easy. Best of all, the Rainbow Template System is free! Just go to our course website to download our Sparky Rainbow Template with our unique Rainbow Template System to put the power of the rainbow to work for your website! If you are already using some other Joomla template, then download the stand alone version of our Rainbow Template System. It is so flexible that it will work with almost any Joomla template. 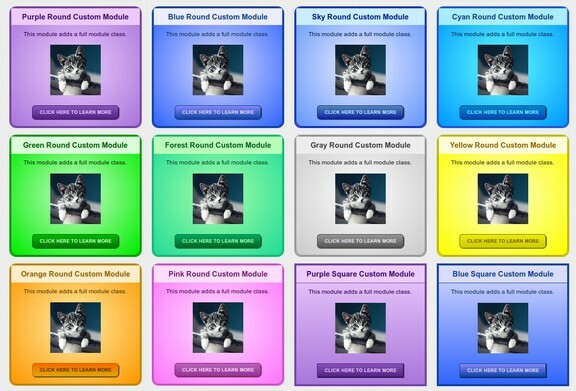 Our Rainbow Template System works on more than just Custom Joomla modules. It will work on any of thousands of Joomla module types - allowing you to style Joomla Feature boxes quickly and easily. #9: We use categories and folders to carefully organize website content. We spend more time than most other web building courses focusing on how to use predefined categories to structure your website content and menu items in a manner which can grow as your website pages grows. This crucial step is as important as planning the positions of your walls when building a home. One area where Joomla is lacking is in form creation and data processing. In particular, the Joomla registration form lacks an easy way to add custom questions and then download the data. We show you how to add a free form building tool which you can use to create your own custom registration form. What about just hiring a consultant to build your website for you? In the past, it was common for commercial businesses, social and educational organizations to hire a staff of consultants to build and run their websites. Farming out your website to computer programmers works well for larger corporations that have the funds to hire a full time Information technology staff. But it does not work well for small business owners who cannot afford to hire consultants. Even simple changes require hiring a consultant for a fee of hundreds to thousands of dollars. If you want to send your customers a newsletter, that is another thousand dollars per year. If you want to set up a virtual shopping cart, that is another thousand dollars. If you want to promote a new line of products or a new set of services, that is another thousand dollars. Even after investing thousands of dollars, small business owners are still left with a website they cannot control and cannot use to grow their business. On the other hand, if you learn how to build your own business website, you can quickly make needed changes to your website whenever they are needed for no cost at all. More important, by gaining a better understanding of modern interactive web tools, you will know what changes are needed and how to do it. Since the Crash of 2008, families have faced the worst Recession since the Great Depression. Millions of people are unemployed right now and many have been unemployed for years. The jobs they once had no longer exist. As larger corporations downsize, we need to create a new economy by increasing local small businesses. But existing small business owners are also struggling to survive in this economic downturn. As families cut back, they have less income to spend at local small businesses. Without these customers many small business owners are themselves faced with either reducing their expenses or trying to expand their market base. An effective website can help meet both goals. The cost of leasing a brick and mortar store typically exceeds $12,000 per year. By comparison, a virtual store using the process described in our course is less than $60 per year. This extremely low overhead can make the difference between growing your business versus going out of business. This low initial cost will also make it much easier for a person without a job – but with a great idea – to start an online business. It is therefore worth the time and effort to learn this extremely powerful Content Management System. This course will help you reach your goal of building your own profitable small business website. Some categories of products are switching to an online platform much faster than others. The fastest growing online categories included specialty retailers, digital content and subscriptions (virtual products), consumer electronics, toys, clothing and books. Each of these categories grew at least 15% in 2016. The future looks even brighter for online stores. This rapid growth is being driven by more people discovering the benefits of shopping online. Polls indicate that 3 in 4 shoppers now make at least some of their purchases online. One in three intend to do the majority of their Christmas shopping online. As just one example, a November 2016 Bloomberg poll showed that more than half of all shoppers now research products online before making a purchase. Three in ten said they were going to do most of their shopping online. Online Christmas season sales are growing at a particularly strong rate – with Black Friday being replaced by Cyber Monday and online holiday sales now at about 20% of total holiday sales. Reasons given for making online purchases include lower prices, greater convenience, greater selection of products and an ability to do better research online. Free shipping is also becoming an important marketing tool – with 55% of online shoppers now expecting free shipping according to a survey by Shop.org. Web searches and online retailer email announcements have become increasingly important. In fact, nearly half of all online users report doing a Google search at least once per day! As we continue to move towards a knowledge based economy, having an online store will becoming an increasingly important factor in the success of any business. Our goal is to help you learn how to control the content, appearance and function of your business website so you can have greater control over the success of your business. 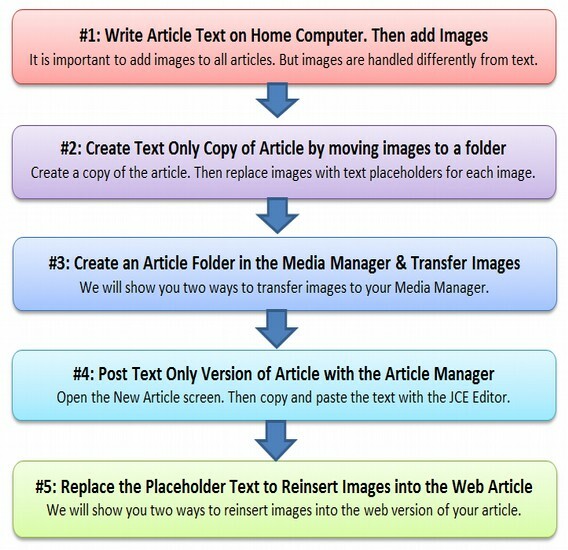 Our book and website divides the process of building your Joomla website into a series of ten steps. These are also the ten categories on our website and the ten chapters in our book. This course, Create Your Own Interactive Website, is the second course in our 8 part series of courses at College in the Clouds. The website for our fifth course is createyourownebook.org. If you would like to learn more about building your own business website, there are several things you can do. Second, buy our Ebooks and read on your portable reader. All of our course books can be purchased as PDF books at a link provided on our websites. They can also be purchased as Kindle Books through Amazon.com for reading on Kindle Readers. The cost of these Ebooks is $10. Third, buy our course book. Our course book can also be bought as a print book at a link provided on our website or through Amazon.com. This reference book can be a great aid to keep beside your computer and refer to as you are building your own interactive website. The cost of our print book is $20 plus about $5 for shipping. Fourth, watch our free course videos on our College in the Clouds You Tube Channel. Each of our courses has its own Youtube channel where beginning in the Spring of 2016, you can watch free videos of concepts discussed in our course. Each video will be about 10 to 15 minutes in length and demonstrate how to perform many of the tasks described in the associated chapter of our course. Just click on the menu item called Course Forums. Our course forum is divided into the same 8 courses as our websites and books. Sixth, sign up for our free newsletter – also at collegeintheclouds.org to receive updated information on how to create an interactive Joomla website as well as all of our follow up courses on how to expand your Joomla website. We offer comprehensive individualized courses. In each course, we work directly with you to design and build your own interactive Joomla website. Each of these three courses includes a fully built Joomla website, domain name, web hosting and a full year of individualized instruction on how to use all the tools that come with your interactive Joomla website. The first chapter of our course covers four important topics. We will begin by explaining in detail ten major benefits of Joomla over Wordpress and other web building tools. The second section provides a brief history of the Internet to help you better understand why it is structured the way it is today. The third section covers how to select and protect your domain name. The fourth section of Chapter 1 reviews how to choose a reliable web host. Now that we understand the structure of our book and our course, let’s get started!